The final section of towpath is quite interesting. It seems the scenery changes constantly as the path winds the Potomac Valley between Oldtown and Cumberland. One moment, you're riding through deep secluded forests, and the next moment you are passing a quiet suburban development. Then you find yourself riding through a peaceful mountain meadow, and the next thing you hear is the clanging of railroad cars being switch at a nearby by yard. These days, this final stretch of towpath is in excellent condition. The path ends at the Western Maryland Scenic Railroad Station, located just north of the Interstate 68 bridge. The canal itself was filled in back in the 50's for flood control, so the towpath is all that remains. An on going waterfront revitalization project is working to restore the canal to its formal glory. Originally, the canal was supposed to continue farther west to Pittsburgh, thus joining the Ohio River to the Chesapeake Bay (hence the name). However, by 1850 the railroad had won the race to the west, so further construction plans were scraped. In December 2006, the eastern end of the Great Allegheny Passage Trail project was finally completed. In combination with the towpath, this new rail trail creates a 330 mile long, traffic free greenway between Washington, DC and Boston, PA (just outside Pittsburgh). I can report that this new trail is simply fabulous! 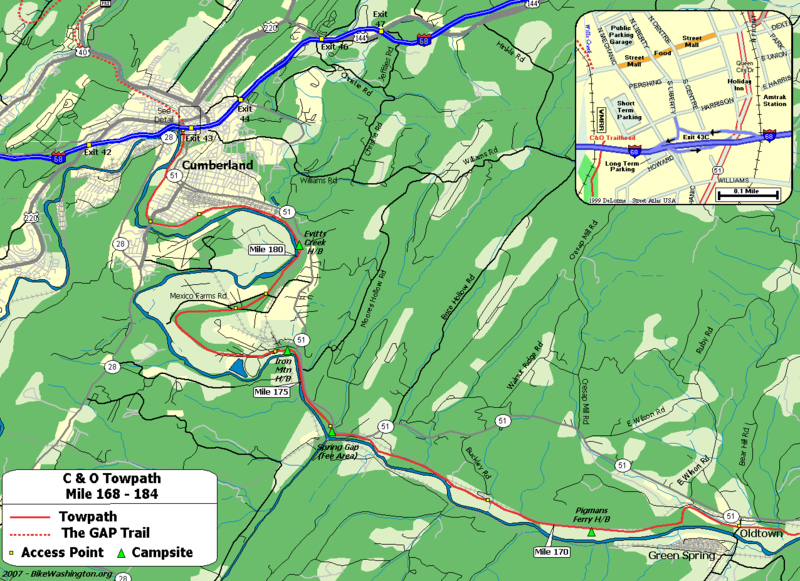 As an added bonus, the 15 mile section from Cumberland to Frostburg runs right next to the Western Maryland Scenic Railroad, so you can try to pace the steam locomotive as it makes the 1500 foot accent. Meanwhile, work continues on the western end to extend the trail the final few miles into downtown Pittsburgh. Cumberland, MD is about a two hour drive from the Washington Beltway. The parking lot of the Western Maryland Rail Road (WMRR) is located at the end of the street. The new long term parking lot is located under I-68 at the corner of Mechanic and Howard Streets. 184.5 Western Maryland Scenic Railroad (map) 301.759.4400: Scenic Railroad up to Frostburg, MD. Follows the Great Allegheny Passage trail. They offer an option to ride the train up with your bike, and then bike down. If you take your bike, you can also make a side trip up to the Mason-Dixon Line and the Big Savage Tunnel. 184.5 Cumberland Trail Connection (map) 301-777-8724: Full Service Bike Shop located just off the trail. Many rental options. 14 Howard Street.